Getting to page 1 of Google is a must for any business seeking to tap into a constant stream of new customers. There's so much false information and false promises out there that it's essential to have a grasp of the basics so you can identify the good from the bad. The common selling point of many SEO (Search Engine Optimization) spruikers is back links. It's no secret that Google ranks the importance of a website based off how many other websites link or point to it. The more websites pointing to yours, the more important Google views your website. But always remember that back links aren't the be all and end all. If you have a rubbish website no amount of back links will help you climb the rankings. The great thing about Google is they tell website owners exactly what the want and how they want it. When I say rubbish website there are many things that can make a website rubbish, from irrelevant content to poor functionality. Today when I say rubbish I'm focusing on 2 things, loading speed and usability. Simply enter your website in the space provided and Google will tell you what changes you need to make to your website. It looks at your site from 2 angles, both mobile and desktop, and will give you a ranking out of 100 for speed and user experience. Google understands that the speed of your website is important because from all the data they collect they know that if someone visits your website and it takes too long to load, they'll click the dreaded 'back' button and go to another site that loads nice and quickly. Another common item in the speed section is browser caching, meaning whether you've got it set so that browser (Firefox, Chrome, IE, Safari etc) can remember elements of your page. A simple htaccess file takes seconds to create and can improve your speed rating with Google by over 10% which clearly gives you a big advantage when it comes to climbing the rankings. A big problem with many sites is their use of images. Good quality images are great for your business but they also take up a lot of the bandwidth from your site by being downloaded every time someone accesses your site. Don't rush out and get rid of your images - compress them! You can have the same images on your site that don't require the current high rate of downloads, compressing images can often save 50% download time of the images and best of all it's really easy to do. This website allows you to drag and drop your images and it will then compress them accordingly. Don't expect 100/100 with Google as some elements that are required for your site to function will slow it down. The sites we create to get found online typically rate at around 99/100 for user experience and 90/10 for speed, this is one of the reasons we're so good at getting businesses found online. Do you want more customers for your business? Make and inquiry via our website and we'll happily give you a simple plan to implement. Our online business directory is gaining real traction among business owners keen to advertise their businesses and get more customers in an effective manner. Because of the success of the directory we're enabling business owners to create a full page to advertise their services as well as providing information about their business and service area. This is currently a free option so it's certainly worth taking advantage of. Click here to get a dedicated business page for your business. Our mission is quite simple, we connect businesses with customers already looking for their services. Thus far we've been incredibly successful in our efforts. If you'd like some extra information about how we can help your business get more customers please make an inquiry via our website. 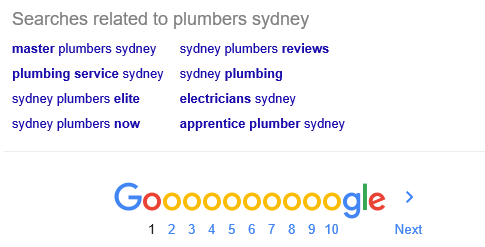 I've researched thousands of online reviews that relate specifically to Plumbers. What I've found is that there are 8 common complaints. Below is a list of the complaints and a quick guide to making sure you never encounter them again. 23.5% of people complain about receiving an overpriced estimate quote, being overcharged or feeling that the price is unreasonable. FIX: This complaint should be countered by being upfront and detailed. Most complaints simply come from a lack of understanding so be sure to detail invoices/quotes to include all charges instead of just an overall figure. Call out fees, parts and labour should all be itemized. When labour charges relate to time periods be sure to provide your estimated time period to complete the job and if the job requires you to go over that time period be sure to clearly explain why, why it was out of your control and not known before the quote was given. 14.5% of people complain about the poor quality of work or the negligence of plumber to properly complete the job. FIX: Ensure that your staff are always trained in the best practices. Mistakes can happen so if in the event a job is not fixed to your standards offer to come back and fix it free of charge (or the necessary charges if new parts are required). While fixing mistakes may cost your business money to start off with the positive impressions you leave with customers will repay this investment. Negligence can also be brought about by not leaving the job as found so always look to clean up and leave the job in a position that requires the customer to take no action once it’s complete. 12.5% of people complain about bring disappointed because of the plumber’s lack of knowledge or proper skills. FIX: Ensure that your staff are always trained in the best practices. Always look to upskill staff. A large part of this complaint stems from communication, a quick explanation of the job and what was/is required will leave the customer feeling satisfied with the plumbers knowledge. FIX: Be punctual and plan in advance. Account for travel time between jobs and always plan ahead and leave extra time where appropriate. If jobs are being booked for a plumber by an admin department then ensure they are both on the same page and in regular contact. If the worst case scenario occurs and it’s impossible to arrive on time give the customer as much notice as possible, apologise and set a new time that is achievable and suits the customer. When an appointment has been rescheduled ensure it’s an absolute priority. 9.5% of people complain about poor communication, receiving a late response or not receiving a call back to a voicemail or message. FIX: Organization is a huge part of maintaining relationships with customers. If an admin member is handling enquiries ensure that they have all of the job information available and it’s also readily available to the plumber. If you are a sole trader that manages your own appointments it can be difficult to look after the administration aspects in addition to completing the plumbing jobs so use your time effectively, get a phone system that is legal to use while you’re driving and make call backs while driving between jobs. Make call backs a priority to get to as soon as you’re available (Equally, when your on a job focus on the job as customers don’t look kindly at being charged and hourly rate while you’re on the phone to someone else – even if you’re not going to charge them for that time). Another great solution can be using a virtual receptionist or answering service which are available at extremely affordable rates. 6.5% of people complain about not expecting a call out fee. FIX: Be clear and advise your call out fee policy prior to accepting the job. 5.5 % of people complain about the customer service being poor. FIX: Customer service is extremely simple yet something that can often be over looked. Smile (no one wants to speak to someone having a bad day), use the customer’s name, clean the work area when the job is completed and don’t complain or criticize the client under any circumstances (Especially if you’re correcting a botched DIY job, simple human nature shows that people hate being criticized and the client will be left frustrated or unhappy even if you’ve done a great job). 5% of people complain about the discourtesy, misconduct or inconsiderate behaviour of the plumber. FIX: To some extent this complaint generally stems from one of the above complaints. It’s discourteous and inconsiderate to not show up on time, it’s discourteous not to employ the basics of customer service, it’s inconsiderate to leave the job in a mess and a customer generally views misconduct as being over charged so be sure to clearly explain all charges. So you know that it's important to rank well for what your customers are searching, but how do you figure out what they might be searching? Well, it's surprisingly simple. 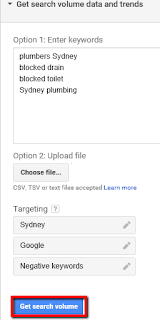 Start out by typing your service and location into Google. Right down at the bottom of the page you'll see a 'Searches related to' section. Why does Google show this? Because that's what people are searching. 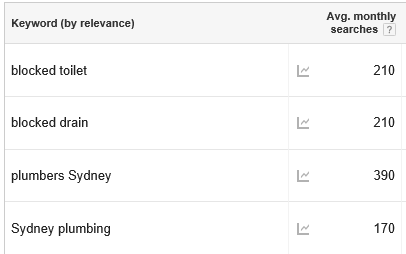 You can then take these search terms, plug them into the keyword planner and see whether it's worth your business ranking for those terms. Simple. You can also view the keyword planner tutorial here. When looking for keywords be sure to think outside the box. Don't just search for the industry you're in but search for the services you provide. Finding how often searches that relate to your business is an essential step that can be worth so much money because it tells you what your potential customers are looking for. This is a quick guide to show you how you can easily get the search volume of any terms in any location directly from Google. You will need an account. If you have any Google account you can use that or you can quickly register with any email. 2. 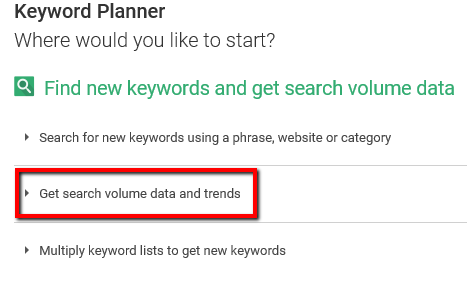 Once you're signed in click 'Get search volume data and trends'. 3. Type the keywords or search terms you want to check (1 term per line or separate them with commas). 4. 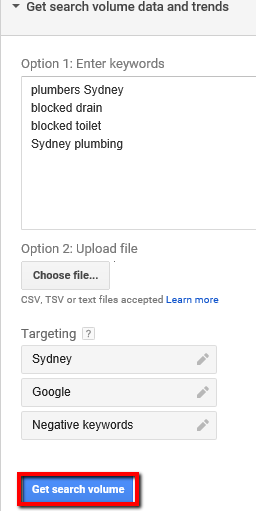 Select your location (if you have a local business that only services Sydney there's no point getting the data for all of Australia). 5. Click 'Get search volume'. 6. 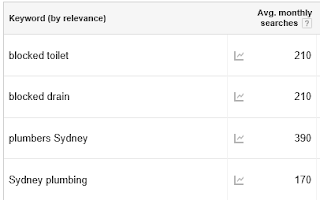 You will now get a list of your search terms with their average number of searches each month. They keyword planner has plenty more features you can go into but even with this basic use it's an extremely valuable free resource for any business owner. Stuck on ideas for what your customers might be searching? Check out this blog post with some great tips to get as many terms as possible. Just a quick post on the value of customer surveys. These surveys require next to no work but can provide a huge advantage by distinguishing customers that are happy and those that need a service. That's a basic template for a quick customer survey. You can have it jazzed up and placed on a web page or you can send it out via plain text email. Either way it will serve it's purpose of identifying which customers require attention and which customers are happy enough to request reviews from (or look to continue relationships for repeat business and referrals). Recently I've been speaking to a large number of plumbers due to our management of the Australian Plumbers Directory. Our aim here at Direct Exposure Marketing is to help business be more successful and a huge part of success in business is engaging the best practices to avoid negative reviews, getting as many positive reviews as possible and securing a huge amount of repeat business as well as a ton of referrals. Today I want to share some really valuable information that I have found works so well to develop a strong online reputation. Although this information is tailored to the plumbing industry you'll notice that it can be applied to any industry successfully. The most common causes of negative reviews for plumbers (and how to avoid them), how to get positive reviews and finally, how to drive repeat business and get referrals. I’ve researched a huge number of reviews and found there are 8 types of complaints that occur regularly. Keep in mind that research shows an individual with a negative experience will tell twice as many people as an individual with a positive experience. Chances are you’re aware of a lot of these but refresher never hurts and making new and existing employees aware should be a regular business practice. It take no more than 2 minutes each week and the benefits can be enormous. Providing a great service will always be step one to getting positive reviews however providing a great service alone does not guarantee an influx of glowing reviews. Negative reviews are twice as likely to be shared as positive reviews and recent research shows that it takes 12 positive reviews to cancel out 1 negative review. What this means is that your great work can be quickly undone. To craft an impressive number of positive reviews and keep any negative reviews offline start out by conducting a survey. This survey can something as simple as an email of 3 questions (See example here) that is emailed out on the day work has been completed. This will serve 2 purposes. Firstly, in the off chance that you have negative feedback you are given the opportunity to resolve it prior to it being made public. Often people with negative things to say simply want to be heard so if a negative review comes in call that client immediately with the aim of resolving the matter (REMEMBER: Even if you disagree with client biting your tongue is worth it in the long run when one negative review equals 12 positive reviews). The second purpose that your email survey serves is allows you to pinpoint your happy customers that you can then refer online to post their experiences. For example when you get an email back that shows a happy client simply reply, thank them for their time, say how happy you are that you met their expectations and encourage them to share their experience online. 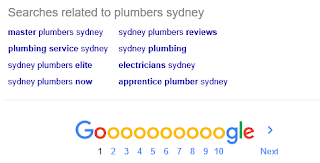 When encouraging clients to share their positive experiences online make it as easy as possible, don’t just tell them to do it but give them a link where they can do it, whether that be via Facebook, Google, Yellow Pages, the Australian Plumbers Directory etc. The easier you make it for customers to share positive reviews the faster you’ll accumulate them. Don’t be worried if every happy client doesn’t rush to share their experience online because quite simply you’ll never get a 100% success rate. If you want to encourage them further offer a deal for the next time they call such as no call out fee or labour reduced by 10% etc. This will even further satisfy your happy client and also increase repeat business and any money ‘invested’ in this deal will be paid back many times over when these positive reviews cause more new customer to call you. Make getting your customer email address part of every job. This allows you to send your survey and then drive repeat business. Repeat business can be massive, you have a 5-20% probability of getting a new customer while you have a 60-70% probability of selling to an existing customer. Send a monthly email/newsletter. This allows you to keep in contact with your customers so that next time they need a plumber they remember you. Your newsletter can be brief and feature the types of work your doing so that next time that customer needs that type of work completed they know who to call. Always give 2 business cards at the completion of a job and tell the customer that one is for them and the other is to give to anyone that needs a plumber. Telling them why you’re giving them 2 cards is essential and is proven to be an effective way of gaining referrals. For large margin jobs a great step can be providing a bottle of wine with 2 business cards. That way when the client opens the bottle with friends where they got it from can become a talking point and lead to them sharing your details. Other outside the box ideas include providing fridge magnets, mouse pads and other low cost items that can include your business logo and contact details. You can purchase these items extremely cheaply over the internet. Providing such items ensures that your contact details are always within easy reach when they next need your services.